Starting your own Saree business is one of the most profitable businesses keeping in view the large demands. 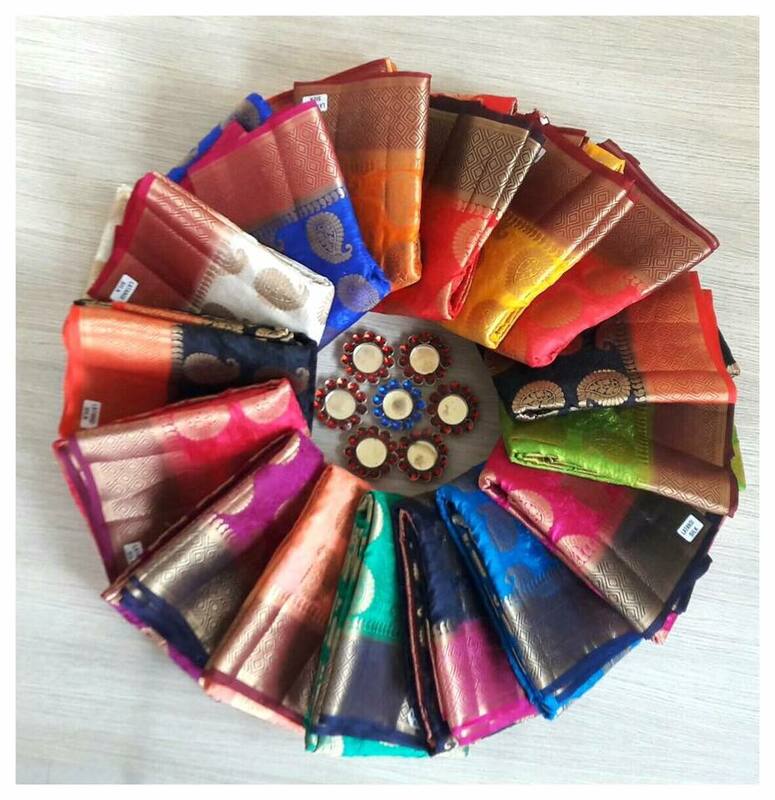 There are large varieties of sarees available which come from different places, so you need to first decide which type of saree you want to sell and where do you want to start your business. Here are a few tips for starting your own saree business. If you don’t want to be specific with the kind of saree you want to sell then you can take a country wide tour of different places where sarees are made and then get in to an arrangement with them to sell you the sarees. You may go to Varanasi, Surat, Bangalore to have a better idea of different popular sarees which remain in demand. If you are a complete novice in this business then it is important that you do a job in a saree shop so as to get a better idea of the same. This experience will go handy when you start your own business. You can either open a shop or you can initially start this business from home itself. An average range of a saree may vary from Rs.300 - 2500. But more elegant and more embroidered sarees cost may even go to Rs.30,000 also. So you can easily earn a great share of revenue in this business. Before you begin to sell the sarees the very first thing to know is- what is your target customers. There are a number of businessmen who sell all types and varieties of sarees like the Punjabi, Gujarati and to all kinds of women-housewives, society ladies, senior executives ladies etc. In this regard the target group is extremely large and it may become possible that you are not able to fulfil the demands of one and all. So the best option when you are just going to start the business is that limit your target customers. Just try to fulfil the demands of one or two kinds of customers. So be selective since then you can easily get references and recommendations from this group. Also try to stick to a medium range, it shouldn’t be too high or too low. This way you can start your business and once it prospers you can expand it to other groups also. In order to know what to sell try to meet local saree shop owners who will give you an idea what sells the most, you can also meet some ladies to get the idea. Ask them to help you in popularising your business, you can show them some of your designs. Opening a website to showcase what designs you have in store can also help. These are the things you need to keep in mind concerning Arrow Garment Franchise. With the information presented in this article, you already know what this kind of business is and how to avail it. Donâ€™t know how to start a garment business? Well, you can use this guide to determine the things that you need to do for starting your garment business. I am interested to start up an embroidery services. Can you help me in building up a business plan or share me a sample business plan. Also, i need to know from A to Z (training to setup) and if possible some tips on linking the business with some other ventures to start the income. Bangalore, Karnataka - INdia. I WANT TO START SAREE BUSINESS AT HOME ITSELF ON SMALL SCALE. I am planning to set up Saree manufacturing business. Kindly, let me know the business plan, regulatory frameworks and the ways to set up. I'm from Malaysia and I would like to do saree business and I would like to buy boutique collection. Where can I get and who can I contact for more details. Please advise. I'M FROM KOLKATA (WEST BENGAL, INDIA)..AT FIRST I WANT TO START ALL KINDS OF SAREE BUSINESS AT HOME ITSELF ON SMALL SCALE..WHERE SHOULD I PURCHASES SAREE AND HOW TO PURCHASES..PLEASE GIVE ME TIPS. want to start cotton silk saree business and dress material business from home then later boutique exclusively for ladies . I wish to develop my saree business. I want details of new design of saree and wholesale rate and retail price. how much the benefit for one saree. Please guide and suggest me about this details. thanking you. I want to start the retail business of Sarees, dress material, and ladies wear at home only at Ahmednagar, Maharashtra. Please suggest the wholesalers address and contacts from where I can buy these. i want to start saree business at home. would like to keep exclusive sarees from different places in india. please give me suggestions for starting the same in pune. thanking you. PRESENTLY I AM WORKING IN QATAR AND AFTER COMPLETION OF MY SERVICE BY THIS YEAR END. I AM PLANNING TO START MY OWN BUSINESS IN MUMBAI. PLEASE SUGGEST AND ADVICE ME TO DO THE BUSINESS. THANKS, REGARDS, SHAIKH ISMAIL. I'm from Malaysia, I want to start saree boutiques through online. Please advice where shall i can get the contact. and how to buy. Hi, I'm Jaya from Malaysia, Kajang. I have to know how to start saree and dress material business sales through online. Please guide me in price and material. Thank you. I want to start saree business in bhopal India but i am confused that i will get sarees in low price from where? Pls Help me and suggest me. I want to start small scale saree business in my home at Plot No-AE/57,1st phase, Bhimatangi Housing Board, Old Bhubaneswar, Bhubaneswar - 751002, Khurdha. at present we engaged saree business purchasing from local retail soap.So that my profit margin is vary low.my contact number is 9237756746.
i want to make investment in ladies wear segment(i.e dress materials, sarees, kurties, and also tops and long dress. plz help me out to find the vendors who can provide me better quality at reasonable prices. plz suggest me on this. I`m Embroidery designer and manufacturer. We Supply Crape, Lazor Embroidery sarees and Kerala Saree. Party ware sarees with hand embroidery sarees available. We are interest to do job work also. please contact thepievalue@yahoo.com-9360067189. I would like to do a small scale saree business, where should i get them with lowest starting price. i want to start my bussiness in sales of kurthis ,dress materials and sarees in vizag. where can i get these. is it kolkatta or other place for resonable rates. so please give the addresses and details. Hi, I am planning to start a small scale sarees and dress materials business at my home which is in Mumbai (Goregaon). Please let me know from where and whom i can procure the required material. Also if you can help me contact people who give the raw material on exchange basis if not sold. I want to start a business to sell dress materials and sarees from home itself in visakhapatnam,Andhra Pradesh. I can sell in bulk but don't know how to get customers. Plz help me. If anyone wants to buy in bulk, plz contact : scrap.no.1@gmail.com. I STAY AT BARASAT NEAR FROM KOLKATA. I WANT TO START A SAREE BUSINESS BUT I HAVE ONLY 5000 RUPEES. IN THAT CASE WHAT TO DO? WHAT TYPES SAREES CAN I SELL? AND WHAT WILL BE MY TARGETED CUSTOMERS? I HAVE NO shop. where and how can i purchase mix of variety of sarees(means single -single peace of each variety in wholesale cast). please sent me list of wholesaler with address and mobile no. AND PLEASE HELP ME TO ESTABLISH MY OWN BUSINESS. hello everyone, if u dont mind i have a suggestion that when u post a scrap on this site, plz. write your contact no.or e-mail add. i dont know how can i approach you? thanks. My contect e-mail is --silksareecentre@gmail.com. feel comfortable to approach me.i m a kosa silk sarees supplier. I am living at Mumbai.I want to do small scale business at home .Interested in sarees,dress materials.could you please tell me how to start my business at home and where to purchase in mumbai to start my business.I need tips from A to Z to start at home.thanks in advance for your valuable suggestions & tips. I want to start a professional business - Selling Only Kerala Sarees to local Malaysian nationwide through website. Kindly advise me on how to purchase sarees from Malaysian wholesale with full corresponding address. Kindly treat this as urgent as I am keen to commence this business ASAP. Thanks for your support. i am from kolkata, i sell beautiful sarees from home. right now i am looking for some shop owner who will buy my sarees for selling purpose. anybody interested please feel free to give me a call...number- +919046932821 or mail me at puspendu_1985@hotmail.com . I am a middle-class housewife. I wish to start doing sareee/clothing business just by sitting at home initially. I am a novice in this trade. I have a plan of visiting Surat textile market and invest a limited capital to start with. Do let me know if this would pave a fruitful result in due course. Thanks and Regards. hi, i am shilpi from noida &searching saree & suit supplier for my home business. i have rang 200 to 500. basically from surat. @ananthi, where are you from India? Surat is the best place to buy sarees from, no manufacturer will directly sell you so you have to get the sarees from wholesalers and surat is the best place for it. You have to visit them once and then they can post the sarees for you. Hope this helps you. Thank you sir, please give me wholesalers address with rate ( 150 to 400 )and catalog. hi.im preethi from blore.i want to start saree and dress materials business from home.can u give ideas and where to buy all type of sarees whole sale to sell. @ananthi, use dir.indiamart.com or surat.olx.in for finding some wholesalers. You can also google to find many wholesalers from Surat. Sorry, we have no catalogs to send you. @preethi, you can see some sites in my previous comment. Here are other places in India where you can find wholesale sarees like, Chandi Chowk(Delhi), Karol Bagh(Delhi), Dadar(Mumbai), New Market(Kolkata). hai Im Ellamah from Malaysia would like to do saree trading business online. Could you assist me how i take the sarees from where i can purchase actually to run my own business? @Arun, I really want to enter into saree business. I am a house wife and can operate saree business from my home at Andheri, Mumbai. The target audience can be lower middle class to upper middle class. Please let me know how do you suggest to move ahead? This is Subash Jain From Rajshri Fashions. We Do Wholesales and manufactures of Designer Sarees, Bollywoods Replica, Salwar Kameez, Kurtis & Sherwani. So pls Email to jshrifashions@gmail.com. I am keen to work with you as a result I can send you this Digital Images along with price list of the same and if you are interested then please send me your mail id and phone number . Dear subhas jain, i am interested in the the saree business kindly send me the link in the id sjethy_magma@yahoo.com my no is 099370-68006. i am from cuttack orissa. I have a small boutique. Main product is exclusive saree. Mainly acid hand paints, block prints, batik on matka, silk, ghicha, tussar and cotton sarees with exclusive look. I want sell as a whole seller or a retailer. Also want to export my products. Please assist. My business place is near Kolkata, West Bengal. My contact no. 09434223914 and e-mail id is souravhiya@yahoo.co.in. i'm living in canada Toronto i like to start saree and salwar online business could you please help me how do i get all info or where do i start from? thanks. Hi, i am doing a small scale business of salwar materials as home shop. I would like to expand it a little more to sarees also. kindly let me know where i would get to purchase right from the source so as to reduce the middlemen charges. I am interested in Maheshwari, chanderi,crepe, kota high end cottons, pure silks etc. i want to start saree and dress material and ladies inner garments from home KINDLY let me know the best wholesaler in mumbai, culcutta and surat. @Kamal, i know you need help, can you explain your business status, budget, requirements. It will be easier for someone to help you once he/she knows these factors. I am based in Clayfield area in Brisbane and would like to start up either an online saree shop or at home saree shop. i have resided in NZ FOR LAST 15 YEARS and have sales and finance management experience. If someone is looking at doing similar or needs someone to sell indian costumes ets in this area then please contact me on above email address or ph no. (07)31722016. This will be a good business around this area as there are hardly any similar shops around which is a pity as there are many indian families based here who have to look elsewhere for their indian needs. I likely to start business in my home, i like to purchase Saree for cheep and best quality. Where can i purchase. Can you please give reference about Bangalore and surat. This is Arun Tiwari from Surat. Want to give some advice to all of you who wants to start small business from Home. 1) If you want to start your saree business only for rupees 10,000/- to 20,000/- only then try to buy sarees from your city. Because it will be more costly from Surat- delhi/ other place. I want to start a business of sarees in jaipur so i want to know that whats profit margin in this business.Sarees range will be 250 to 3000. Hi, I am planning to start saree business from home in Dubai. So I need whole sale shop details in dubai and India. How to bring material from India. I am small amount Investor and I need very good tailor from India. who is able to cut and stitch all patterns. How to Start Logistics Business?